Humblearts Journal: Oh, look she's back! My, oh my. I am a long lost blogger. I can't believe how busy the last few weeks have been. I have a million unanswered emails, but those will have to wait until tomorrow when I have a few more recovered brain cells. BUT, I did want to tell you about some places you can spot my beads in print this month. First, for the new beaders there is Bead & Button's Beading Basics, Essential Techniques. Inside you can find my cuff bracelet project and it's on the DVD that is included. You can find it on newsstands December 19th. 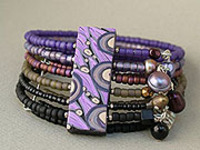 I have two articles in the December issue of Step by Step Beads. 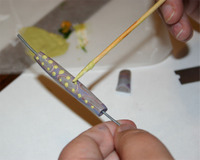 A very fun and funky tassel necklace and my first polymer clay bead-making project; a faux lampwork technique using oil paints and liquid sculpey. So now you can tell everyone you know someone famous. HA, HA! I know the feeling...having just recently surfaced from the long-lost-who-knows-where. :) Congrats on your dvd and articles. You must be so sxcited.